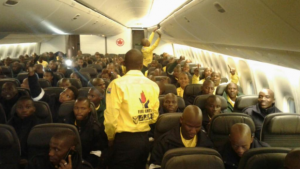 The crew began the almost 16,000-kilometre journey from Johannesburg on Sunday morning, stopping to refuel in Barbados. The crew on board flight AC7007 is expected to land at Edmonton International Airport at around 9:30 p.m. MT. Apocalyptic sized wild fires have been burning in Fort McMurray, Alta., Canada for more than a month now, leaving behind a staggering scale of disaster.